I went for hiking last Sunday. I still cant believe that I actually did it. This is because I never thought of hiking. Well, it is my mom that insisted me to hike with her @_@. But I never regretted it because it is such a wonderful experience! 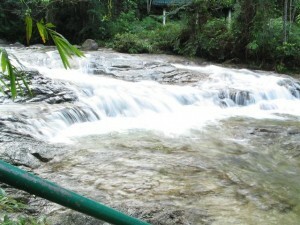 The place that I went for hiking is actually famous for it waterfall. It is located near Taman Ros (?). The waterfall is located at the upper part of the hill. The journey from the bottom of the hill to the waterfall is about 30 minutes by foot. Along the way to the waterfall, you can see the orang asli settlement. Half way through the waterfall, the road will become narrower and bumpy. So, I highly suggest anyone that planning to go to the waterfall not to take their car with them. ^_^; You can park it at the bottom of the hill. 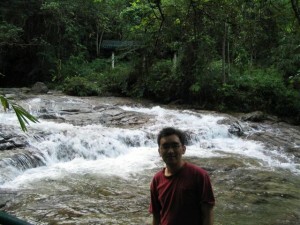 This entry was posted in My Life, Photos and tagged hiking, kampar, photo, waterfall on January 6, 2009 by Khim Hoe.